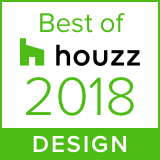 Following the Architects’ lead, Rogers Krajnak Architects Inc of Columbus Ohio, we created a new back entry leading to a renovated kitchen, half bath and mudroom. We also built a detached garage that complements the style of the house. 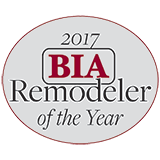 The goal was to integrate modern conveniences while enhancing the character and integrity of the home’s original design features. Most homeowners upgrade to an attached garage, but sometimes you need to break out of the box and do what works best for the homeowners. 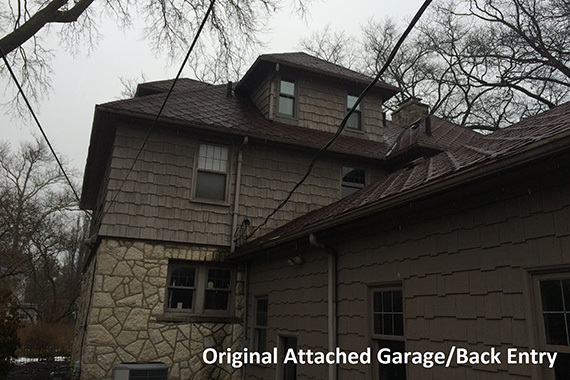 In this case, the existing attached garage was causing more harm than good. On occasion water leaked in from the garage’s side entrance causing the basement to flood, plus the garage took up prime entertaining real estate in the backyard. It was time for this nuisance to go. 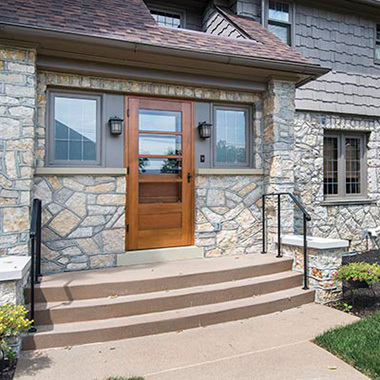 We demolished the dysfunctional attached garage and created a new entryway to the home. Then we built a detached garage at the rear of the house, giving the homeowners a new grassy area and garden spaces in their backyard. 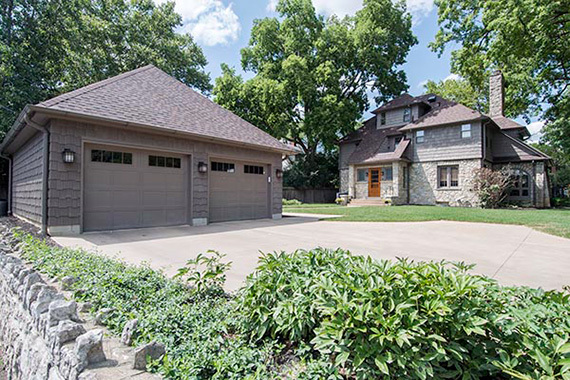 Respecting the turn of the century style and charm, the new garage has carriage house garage doors, siding and shingles that match the house, and a Douglas fir door built to match the back entry of the Tudor home. That gorgeous new back entry Douglas fir door adds a welcoming focal point to the new back entry. This type of wood has a beautiful grain pattern and is a great choice for exterior doors because it naturally resists weathering. Also adorning this back entry, wood window casements surround triple pane windows with leading to match the existing windows on the house. 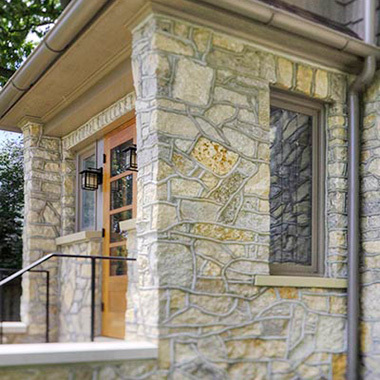 We recreated the lost art form of convex beaded mortar joints on the exterior stone work and installed Limestone wall caps for a classic finish. 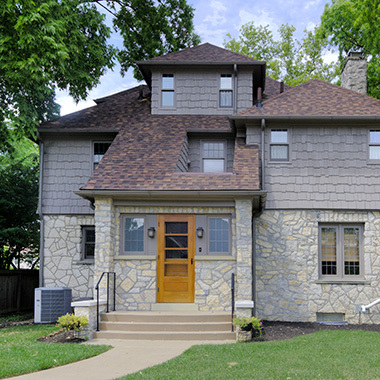 Maintaining other existing home details, we extended a 6” half round continuous gutter and 4” round downspouts. 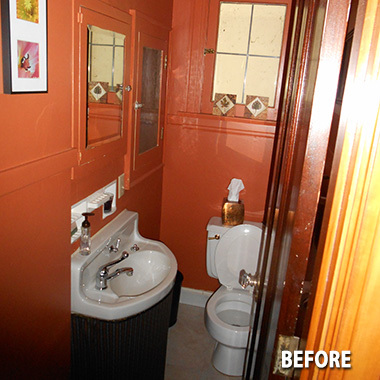 We even matched the exterior crown molding in style and paint color so that no detail was ignored or compromised. 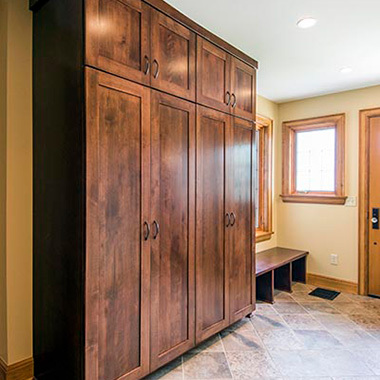 Custom cabinetry runs from floor to ceiling for tons of storage in the mudroom. One half is a pantry unit with adjustable shelving while the other half is a coat closet. Complimented by adjoining bench seating, there’s also space to stow shoes. The new half bath design focus was simplicity that continues the blend of old and new. 13” x 13” ceramic tiles were selected in neutral tan tones to harmonize the mudroom entry and ½ bath area, but added a subtle twist by installing the tiles on a 45-degree angle. 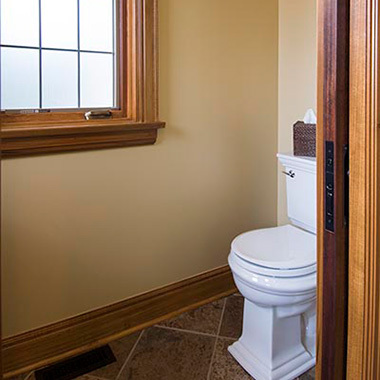 The base, door, and window trim all match the existing home in color and style, and we repurposed an old interior door to use as a pocket door to the half bathroom. 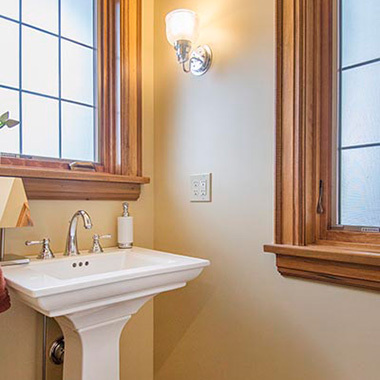 Finishing touches include a period appropriate faucet, pedestal sink, and light sconces. Additional lighting was integrated inconspicuously with can lights. Custom full overlay, mission style flat panel door cabinetry was installed in the kitchen to match the mudroom cabinets, keeping a consistent look. Special features include a built-in refrigerator panel, raised bar countertop seating, integrated wine box shelving, and even a hidden laundry chute. All the wood is custom stained to match the clients’ buffet, which is in the seating area. Stove We replaced an existing window with a shorter version to create a new spot for the stove. The range hood was purposely selected to have as minimal a footprint as possible; leaving the maximum volume of window still exposed. Breakfast Bar Once the stove was moved a peninsula was added, creating a raised breakfast bar with seating for two. This design change was ideal as the new seating area eliminated the need for a kitchen table, resulting in more open space. Cabinets The soffits were removed to make room for upper cabinets that extend to the ceiling to maximize storage and add height and volume to a fairly compact kitchen design. Though a challenge, sometimes a solution can create unity. In the new kitchen design, not all soffits and mechanical channels could be removed. In fact, one bump out housed the mechanical required for the second floor. In fact, one bump out houses the mechanical required for the second floor. This meant an even more creative design with the sunk-in stove area at the window. 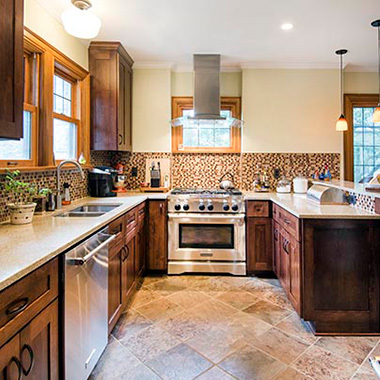 As a solution, another bump out was added to the other side of the stove to balance the design and create a seamless, streamline flow from cabinetry to stove and back to cabinetry again. What was lost in space was gained in design aesthetics. 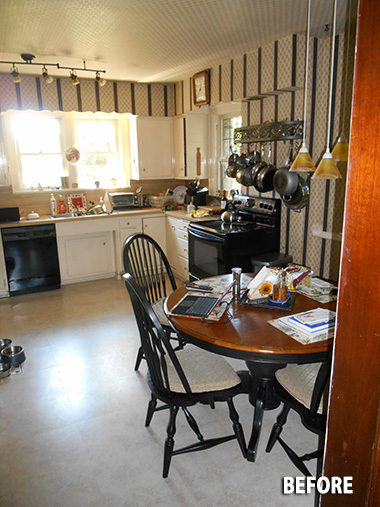 To allow for more countertop space the original pantry was eliminated. Kept however, was the homes original laundry chute access. 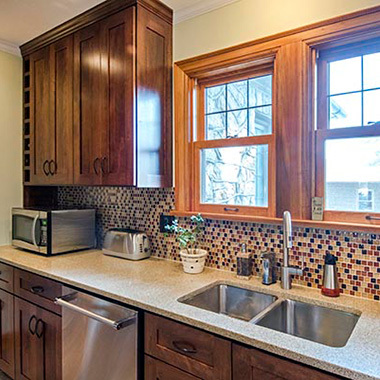 Notice the wood panel at the backsplash area under the upper cabinets. Yes, that area has a door that swings inward to allow continued access to that chute. Selections for the entire remodeled space wavered back and forth between modern and retro. From lighting to appliances to backsplash and beyond, the design is balanced with new and old in a classic gentle design. 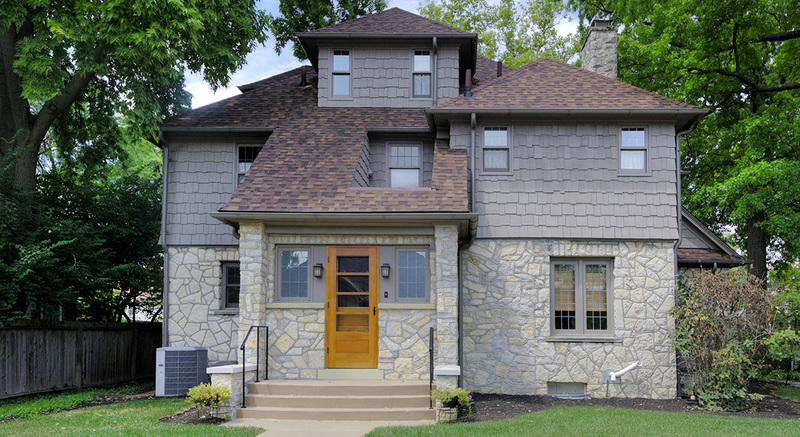 Now this Bexley, Ohio family has a warm, inviting home where modern functionality meets vintage style. What a cool, unique place to entertain friends or enjoy a lazy Saturday at home! 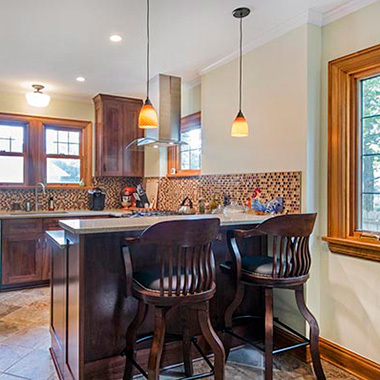 Whether you need an addition to your home, an updated bathroom or a kitchen remodel, NJW Construction creates new spaces that blend in with the rest of your home. Get started with a free consultation!